File photo of homes for sale in Calgary. Alberta's real estate market is bracing for its worst year since the global financial crisis, as hopes dim that an economic recovery can stave off a broad housing correction. Calgary home prices dropped 1.7 per cent in December from a month earlier and have fallen 2.6 per cent since last December, new figures from the Teranet-National Bank of Canada House Price Index show. Overall, the city's home prices are 3.8 per cent lower than their peak in October of 2014. In Edmonton, home prices were down an annualized 1.1 per cent in December. Calgary realtors, who follow crude prices as closely as any oil trader, say the city's market has changed dramatically in the last six months. Everyone is trying to figure out when housing prices will bottom out. Buyers are waiting significantly longer before making a decision, and want a killer deal when they do make a purchase. As layoffs of high-paying energy-sector jobs continue, luxury home sales have been hit especially hard. "It's a tough, tough market," said Calgary realtor Jim Sparrow. Falling home prices in Alberta come even as Canada's housing market recorded a strong year in 2015, with overall home prices rising 6.9 per cent, driven by soaring prices in Toronto and Vancouver. However, analysts expect Canada's housing market to begin to cool this year, as fallout from the deteriorating energy sector and the sinking loonie spills beyond the borders of Alberta. Real estate firm Royal LePage expects national home price growth to slow to 4.1 per cent this year. Adding to the challenges facing the housing market, mortgage rates have begun to creep up, with several lenders announcing rate hikes over the last week. "Looking ahead, deteriorating economic conditions in Canada should translate in softer job creation in the hot markets, while weak resale markets should persist elsewhere," wrote National Bank economist Marc Pinsonneault. "Under these circumstances, we expect a significant deceleration in the national house price index growth rate in 2016." Royal LePage predicts average home prices in Calgary have another 3 per cent to fall this year, while prices should retreat 2 per cent in Edmonton, which until recently had been shielded from much of the energy sector's woes. Home prices should continue to rise in Toronto and Vancouver this year, but at half the rate those markets saw last year, as buyers are pushed to the sidelines by a shortage of affordable options, said Royal LePage CEO Phil Soper. Last year, much of the pain in Calgary's housing market was concentrated in high-end homes and condos, particularly in the city centre, while buyers flocked to detached houses in less expensive neighbourhoods, pushing up prices in the Northern and Eastern parts of the city. The Calgary real estate board said it now expects prices to fall across all segments of the market this year, as the job losses and wage cuts weigh on consumer spending and the cooling housing market hits jobs in the construction sector. Prices will drop the most for condos, the board predicted, falling 4.2 per cent, thanks to what it said were "near-record" levels of new condos and apartments under construction. Many will end up in an already oversaturated rental market, where vacancy rates surged from 1.4 per cent in 2014 to 5.3 per cent last year, matching highs last seen in the 2009 financial crisis. Nearly 45 per cent of the 4,600 homes listings on the Calgary MLS are vacant, said Mike Fotiou, associate broker at First Place Realty. The large number of empty properties for sale is the likely result, he said, of landlords trying to sell now-vacant rental condos and homeowners who have moved away for work. Many are being sold by energy workers who bought condos in the city for the days when they weren't in the oil fields and have since lost their jobs and moved away, said Krista Reiach, Calgary franchise owner at PropertyGuys.com, which helps people sell their homes without a realtor. She estimates nine out of every 10 condo sellers she speaks to are leaving the province. "The oil prices have really hit us hard here," she said. "Every day is just more news of how much harder it is and how many more jobs are lost. People are just leaving." And homeowners' reasons for selling have shifted. In the past, many were upsizing, downsizing and moving to be closer to family or work. "Now, it's people who can't pay their mortgage," said real estate agent Karen Wright. She estimates about one third of her listings are vacant. Even more affordable entry-level homes, which proved surprisingly resilient in the city last year, have started falling in price. "There's more product on the market and the price pressure is now very active. People are feeling desperate and are dropping their prices," Ms. Reiach said. She often counsels sellers on how to stay positive when showing their properties to buyers, talking up their homes' amenities rather than commiserating about the economy. Real estate agent Wes Morrow, who has been in the business for about five years, said two out of three of his current listings are vacant, as people who migrated to the province for work opt to head home. But while December was exceptionally slow, the start of this year has been surprisingly busy. "People are looking at it and going, 'This is our opportunity to maybe get out of the market…before things get worse here,'" Mr. Morrow said. Mr. Soper expects sales to pick up this year even as prices fall, as sellers come to terms with the city's new economic reality. "It's really hard for homeowners to get their heads around the fact that their homes might be worth less than they thought," Mr. Soper said. 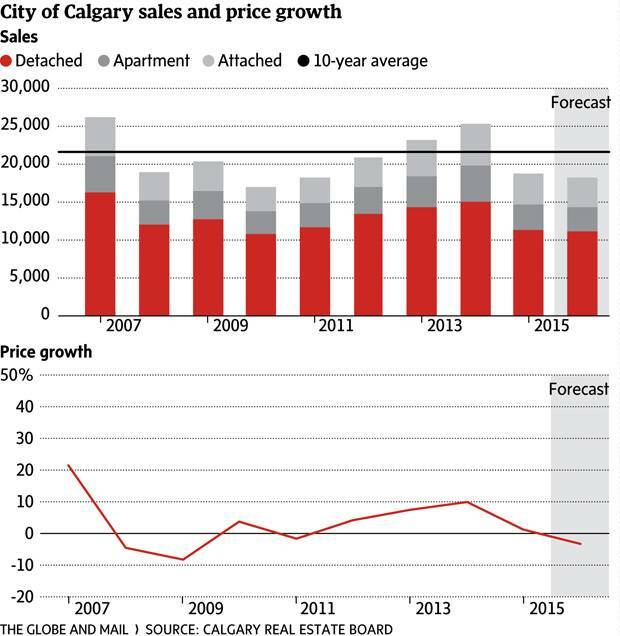 "In a place like Calgary, you automatically just add 10 per cent every year. Nobody is doing that right now." Several mortgage lenders have raised mortgage rates in recent days, adding even more headwinds to a slowing housing market. Last week, Royal Bank of Canada announced it was hiking its discounted fixed-rate mortgages by 10 basis points (1/100th of a percentage point), pushing up its five-year rate to 3.04 per cent, while raising variable mortgage rates by 15 basis points. Several other banks responded by selectively raising rates on some mortgages. National Bank hiked its discounted five-year fixed-rate mortgage rates to match RBC, while increasing variable rates by 10 basis points. Bank of Nova Scotia raised variable rates by 10 basis points within the past week, and said it was not offering any rate specials on fixed-rate mortgages. Canadian Imperial Bank of Commerce hiked three- and four-year fixed-rate mortgages by 10 basis points to 2.59 per cent and 2.84 per cent respectively, but left its discounted five-year fixed rate unchanged at 3.19 per cent. Toronto-Dominion Bank raised its variable rates 15 basis points to 2.6 per cent, but left its five-year fixed rate unchanged at 2.91 per cent. Mortgage rates aren't likely to rise significantly amid a cooling market this year, said Royal LePage chief executive Phil Soper, particularly if the Bank of Canada ends up slashing its key overnight rate again later this month. "Overall, we'll probably see less mortgages written in Canada this year than last, and that means the banks will be fighting for market share," he said. As Canada's economic engine stalls, can other industries pick up the slack?